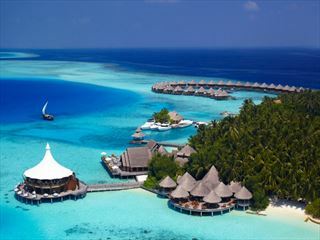 The elegant resort consists of 110 land and water-based villas, each set within lagoons, sandbanks and woodlands. The shady beach villas are extremely comfortable and are designed around a warm and typical Maldivian style that exudes relaxation and charm. 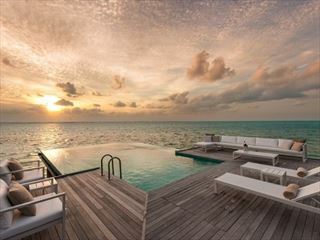 If you want to get even closer to the sea, the small community of water villas and senior water villas stand amid the shallows and offer immediate access to the Indian Ocean with unbeatable views of the endless horizon and amazing sunsets. Constance Moofushi carries its style right across the hotel and offers two restaurants that are both luxurious and chic; Manta is an elegant but casual restaurant while Alizee offers outdoors dining under the stars. The bars of Manta Bar and Totem Bar offer a chance to sit back and enjoy a long drink in stylish surroundings or under the shade of the trees. Spa de Constance offers a full range of treatments including; massages aromatherapy, hot stone massages, facial treatments, scrubs, wraps and more. The spa is set in pavilions over the water and offers an extremely relaxing experience and opportunity to recharge your batteries. Constance Moofushi’s all-inclusive package ‘Cristal’ offers a host of upgrades to enhance your stay that include premium-branded drinks and cocktails, all meals in the Manta restaurant, in-room mineral water, Dhoni boat excursions and much more. Scuba diving is amazing in Moofushi. 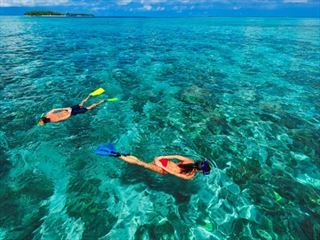 The South Ari Atoll is regarded as one of the best diving spots in the world and you can see why from the moment you put your head under the water. The main reef is just a few metres from the beach and is rich with all kinds and colours of marine life.